For being such a cheap beer, this one has quite a bit of character. 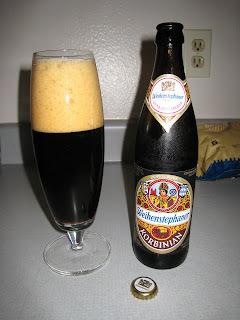 I think this the first Bock that we have reviewed on this site, probably one of only a handful I've ever consumed, and I'm not really digging this. It has a creamy, well aerated head and has a strong cherry smell and taste. The color is black as a stout, with a small amount of nuttiness, but the sweetness definitely overpowers the nut/bitterness. By the end of this beer, I had to drink a Sierra Summerfest and a glass of orange metamucil just to get rid of the taste.